The Hawks will have two teams in the Victorian Netball League finals for the first time in four years, with Round 15 results seeing both our Championship and Division 1 teams assured of finals berths. While neither team was able to add to their win tally in Round 15 against Melbourne University Lightning, results in other games mean they are assured of finishing in the top four. It will be the first time the Championship team has played off in finals since the team’s last premiership in 2011, while the Division 1 side has not reached finals since it was knocked out in the semi-finals in 2013. The 19/U team won a premiership in 2014 – the last finals appearance for a Hawks team. After 15 rounds and with three games remaining, the Championship team is on top of the ladder on 50 points, three wins clear of City West Falcons and DC North East Blaze, who sit in fourth and fifth. But with Blaze and Falcons to play each other in Round 18, finals are assured for the Hawks. The Division 1 team sits in third place on the ladder, but with the Selkirk Sovereigns defeating fifth-placed City West Falcons in Round 15, the Hawks are now four games clear of fifth spot. Meanwhile, all three Hawks teams were in action in Round 15 on Sunday, July 29. Here’s how the round played out. A big last quarter against Melbourne Uni Lightning gave our 19/U team back-to-back wins for the second time this season. In what was almost a carbon copy of the team’s Round 14 win against Southern Saints, the Hawks held a small advantage over Lightning for the majority of the game before ramping things up in the final quarter to pull clear and record an impressive 50-36 result. The Hawks led by four goals at quarter-time and threatened to run away with the game as they pushed their advantage to almost 10 in the second quarter, before Lightning scrambled to be down 25-21 at half-time. A couple of positional changes aided the Hawks’ cause early in the third quarter, but when Lightning rallied late another change was required, with the original lineup steadying to hold a 35-30 advantage at the final change. From there it was all the Hawks, with young goal keeper Alex Stephenson playing coming up with numerous rebounds and turnovers in what was her best game for the club, while goal defence Gemma Thomas and wing defence Holly Keating pulled in plenty of important turnovers in the second half to help their team to a 14-goal win. 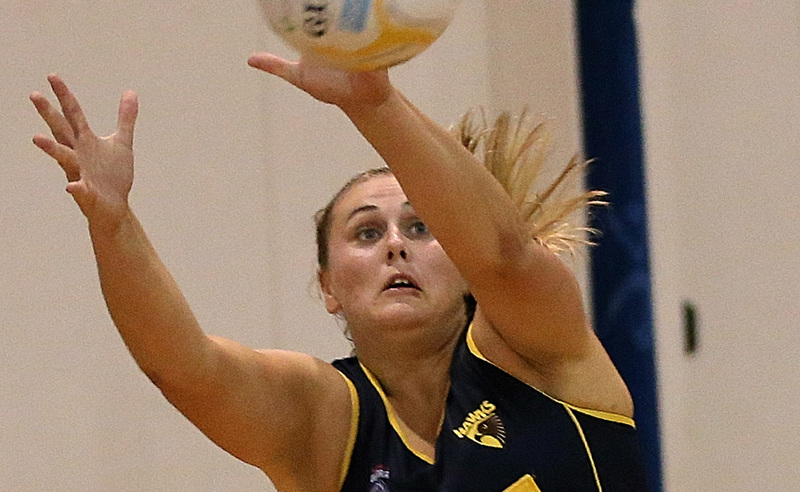 The win was a fitting result for the team in midcourter Kassidy Withers’ 50th Victorian Netball League game, and lifted the Hawks into seventh position on the 19/U ladder. The Hawks’ Championship division team couldn’t repeat its breakthrough Round 6 win against Melbourne Uni Lightning the second time around. With the Hawks having beaten the 2016 premiers and 2017 grand finalists 57-43 when the teams met two months ago, the contest shaped as the match of the round between the competition’s first and third-placed sides. But a rampant first half from the Lightning took the heat out of the contest early, with the Hawks consigned to just their second loss of the season. The Hawks matched their opposition in the opening exchanges, with the scores locked at 9-9 midway through the first quarter. But from there a disciplined Lightning outfit put their foot down, scoring 11 of the next 13 goals to lead 20-11 at quarter-time. Their dominance continued in the second quarter, with the score pushed to 39-20. The third quarter saw Division 1 player Chloe Sinclair make her Championship debut as the Hawks began to score more freely, splitting the quarter 15-15, but the Lightning hit the accelerator again in the final term to win 71-46. The Hawks remain a game clear of both the Lightning and the Geelong Cougars, who the Hawks play in the final round of the season. A raging start wasn’t enough for the Hawks’ Division 1 team to take the points, with Melbourne Uni Lightning clawing their way back into the game and triumphing in a one-goal thriller. The Hawks led 10-0 inside the first seven minutes of the game as they capitalised on every opportunity, but a number of Lightning positional changes helped them drag a couple of goals back, with the Hawks taking a 17-9 lead into quarter-time. The Lightning seized control in the second quarter, scored 17 goals to 11 to trail by only two at half-time. It was more of the same in the third as the Lightning hit the front and led 39-35 at three-quarter time. The teams went goal for goal for much of the final term, until the Hawks’s persistence in defence finally paid dividends inside the last three minutes, with a couple of turnovers allowing them to narrow the gap. But time ran out, allowing the Lightning to hang on for a 49-48 victory. The loss sees the Hawks remain in third place on the ladder, a game-and-a-half behind top spot with three rounds remaining. No Replies to "TWO HAWKS TEAMS FINALS-BOUND!"